• High Stakes Sniping Missions: Earn medals and rewards through the successful completion of missions and objectives while progressing through training sessions and six missions that feature multiple stages and challenging bosses. • Large Arsenal of Guns, Weapons, Equipment and Camouflage - Choose from different sniper rifles, silencers, and scopes to take out your targets from long range or use pistols, grenades, and pipe bombs to take out your targets in close quarters combat. Dress to match your surroundings and to elude return fire. 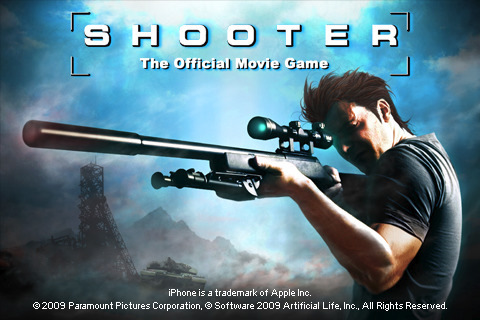 • First Person Sniper Perspective - Use the accelerometer to zero in on your targets with your binoculars and scope. Distance and wind must also be factored into your shot. • Nighttime Missions - Use night optics to target your enemy in a variety of challenging shooting conditions. • Detailed Mission Environments - Execute missions in the deserts, cityscapes, forests, mountains and snow, each of which requires specialized skills. • Mini-Games and Puzzles – Successfully complete these tasks to continue through the storyline. Overcome the odds to uncover the conspiracy and clear your name. And don't forget to visit the iTunes Shooter movie page and add this film to your iTunes movie library. New in this version A bug causing the user’s device to lock-up has been resolved. Ohh, I will try this one, I hope it is easy to controle, thanks you!